I suppose this is the time to confess that I am a Star Wars fangirl. I love all of it: the movies (okay, some more than others, obviously), the books, the comics, the TOYS. Oh man, the toys! In the picture below you see one of my all-time favorite machines: the glorious AT-AT Imperial Walker. This particular one, named Frostbite, is from the LEGO Mini Line (isn’t he cute??). I also own a full-size Walker named Avalanche, and a plush one named Snowball (the AT-ATs in The Empire Strikes Back were part of General Maximilian Veers’s Blizzard Force). So yeah. I’m a bit of a fan of George Lucas and his amazing sci-fi/fantasy space opera. My hubby and I have a big Millennium Falcon hanging on our office wall above my desk. Star Wars Funko Pops intermingle with Star Wars action figures. Slave One sits proudly on one of our shelves in the office. My favorite character, you ask? That old chip-off-the-Jango, Boba Fett, ever since his appearance in The Empire Strikes Back. Being a fangirl gives me the right to not like everything. I don’t like The Phantom Menace. I’m not a big fan of Rogue One. But Star Wars is such an epic, sweeping story that even given those parts of it I don’t much like, it still topples every other fandom for me. I’m also a Browncoat, Whovian, superhero fan, and proud of it. But ask me for my favorite, the one fandom I couldn’t live without, and Star Wars would win every single time. I’m excited for The Last Jedi. I expect good things. We are seeing it Sunday afternoon, so I’ve had to tell others not to give spoilers away. I want to see Rey decide to experiment with the Dark side of the Force. I want to see more of Kylo Ren’s personal conflictions. But most of all? I want to see those behemoth AT-M6s pounding across the battleground. Why? 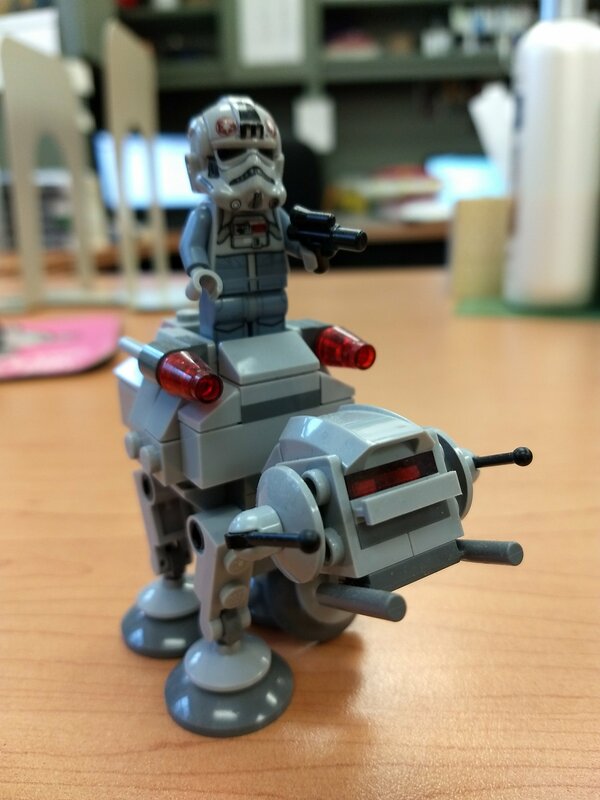 I am an Empire girl, and my dream job in the Star Wars universe would be an AT-AT driver. Have a great and blessed weekend, and as always, MAY THE FORCE BE WITH YOU!